Yesterday I posted about how you can use the VPN Functionality built into VMware vCloud Air to connect individual offerings in the service together. This is of course useful so that some resources in one cloud can communicate to another. For example you may have a VPC and a Dedicated Cloud both in the Nevada location. This means you could have Active Directory in the Dedicated Cloud with the networks of both the VPC and the dedicated cloud defined in Sites and Services since it is the same physical Site. As vCloud Air expands, and you add clouds from other locations you can do the same thing and continue building out software defined Virtual Data Centers, interconnecting various networks as you go building a large pool of Infrastructure as a Service data centers all networked together. However, let’s step back to the original example and examine what you can do to move a virtual machine workload from the VPC to the Dedicated Cloud. Why Move a Workload from VPC to Dedicated? I have no intention of going into the differences here, that is well documented in the vCloud Director user guides, and even in a White Paper that I co-authored last year with Frank Denneman. Albeit the Allocation Pool Settings have changed a bit from the time that paper was published but the bottom line is this. Why is this important to know? Well for any good vSphere architect and administrator, it means that each virtual machine deployed will have different resource characteristics. This is actually a good thing because vCloud Director sets the reservations, shares, and limits for you in VPC, ensuring your workload based on its configuration gets some level of resource guarantees. At this point I am sure the vCloud Director savvy folks are asking, “What are the Allocation Pool Model Settings”. That may be something we put together later, but, again for the purposes of this discussion, it’s not actually relevant. In some cases where you want to specifically over-commit or provide higher levels of resource guarantees you can do so manually in the Dedicated Cloud. Therefore, if you deployed a workload in Virtual Private as a test bed, but then want to migrate that virtual machine or even a template you created that is stored there, you will actually want to manage a few settings after you have moved it. Allow me to show the an example. Note: Moving a workload from VPC to Dedicated Cloud also means moving it to a new network segment located on the dedicated cloud so the machine IP address will change. This is actually the easy part so I won’t spend a lot of time on it. 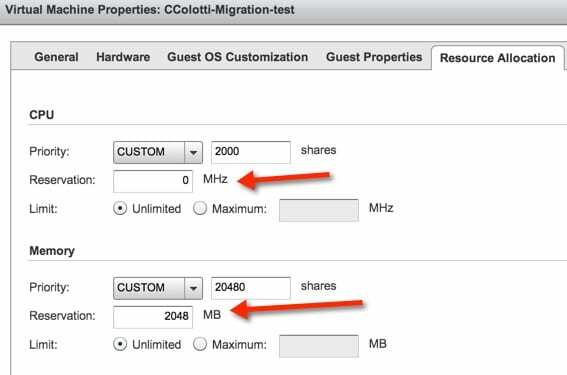 Essentially you need to use VMware vCloud Connector to do the move and make sure you have done the following items. I will not cover the exact things you need to do, but I plan on producing a Technical Paper fully explaining it all in one place at a later date. Once you do this you can use vCloud Connector to copy the virtual machine. Once it is copied and deployed, let’s examine the virtual machine resource allocation settings that will have ben carried over. You cannot see these settings in the VPC cloud, only in the Dedicated due to the allocation model differences. Also you will need to launch the vCloud Director native UI to see them. Below you can see the settings from a virtual machine I deployed in my Virtual Private Cloud and then migrated to the Dedicated Cloud. To understand the settings the virtual machine is configured with 2 vCPU ad 2GB of RAM. You can see that just by copying the machine from my VPC to my Dedicated that certain settings are retained that were set by the Virtual Private Cloud itself. Your settings may look different as my VPC has been around for some time and I am not sure if it is using the same settings as currently deployed ones. However you can see that this machine would be running in the Dedicated Cloud with custom shares, no reservation, and a 2GB Memory reservation. At this point you have a couple of options. You can leave the settings as is and know that the memory reservations will be taken from the overall Dedicated Cloud pool of resources to satisfy this machine. Alternatively you can remove the reservation all together and also set the shares back to normal. In some cases depending on the current VPC settings there could also be a limit set. IN that case for sure you may want to remove that especially if you plan on changing the machines configuration from 2 to 4 GB otherwise you could be sitting with a 2GB limit. I will have to investigate the current settings, since my VPC may not be current. At the end of the day you need to understand that moving a machine from a VPC to a Dedicated Cloud will transfer some per virtual machine settings. You always want to decide if you want to keep these or change them since you have that control in the Dedicated Cloud. Regardless what the settings are you should simply know you want to look at them. It goes without saying that a strong grasp of vSphere resource management is useful when using a dedicated cloud. Finally I will point out that going the other direction from a Dedicated Cloud to a Virtual Private will always reset and assign what VPC based settings no matter what you have manually configured it to be on the Dedicated Cloud. This consideration really is a one-way thing to think about.